Figure F26. Line GeoB 01-030 with Site 1266 and DSDP Site 528 (proposed sites WALV-10F and WALV-10A, respectively) with age estimates of prominent reflectors. 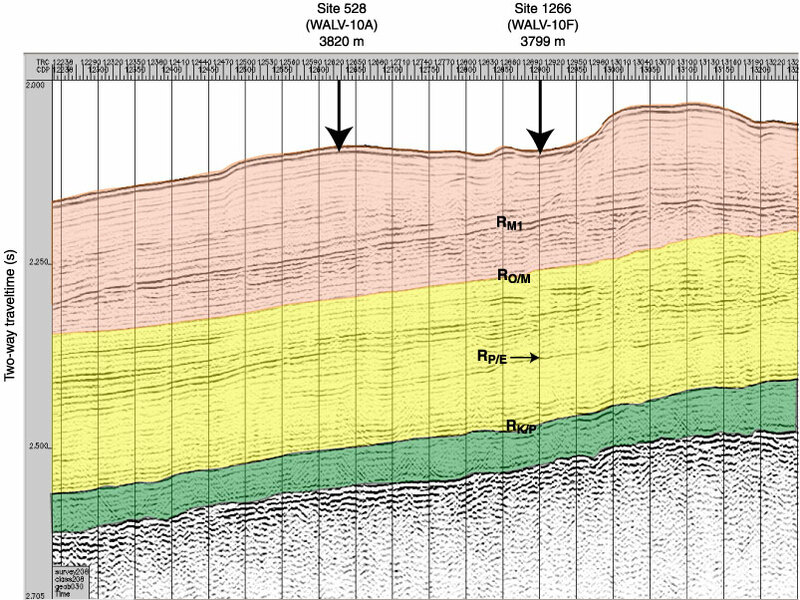 A middlelate Miocene reflector, RM1, is at ~105 mbsf, and the Oligocene/Miocene boundary reflector, RO/M, is at ~140 mbsf. The Paleocene/Eocene boundary reflector (RP/E) is at ~275 mbsf, and the K/P boundary reflector (RK/P) is at 350 mbsf. Both RP/E and RK/P can be identified over most of the surveyed area. CDP = common depth point. V.E. = vertical exaggeration.